Motswiri Lodge is family owned and run, it possesses an intimate and welcoming atmosphere. You will find the lodge on the edge of a Calcrete pan and overlooking a waterhole, where a plethora of mammals, both large and small frequent to quench their thirst. 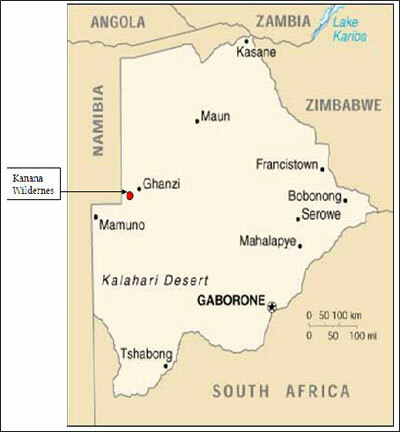 The pan, which is circled by trees, is located in the heart of "Kanana Wilderness" within the Kalahari Desert. 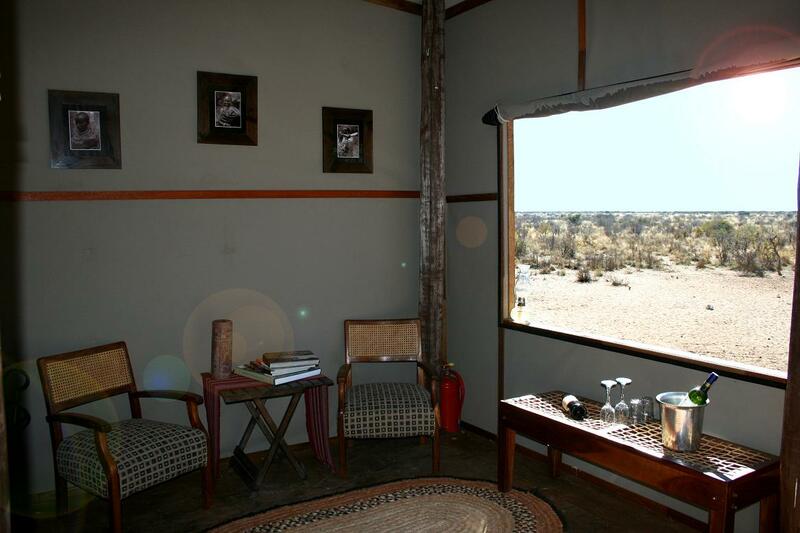 Our secluded camp is in the old African Safari tradition. This is the perfect place to get away from it all and relax. Motswiri accommodates a maximum of 8 people in 4 double walk-in luxury tents. Each luxury tent has two single beds and its own shower, W.C. and washbasin complete with hot and cold water. The relaxed, yet luxurious, walk-in tents tastefully blend into this idyllic, wilderness environment; each with its own porch overlooking the pan. Overlooking the pan you will find our comfortable thatched lounge/dinning room complete with a fully stocked bar. Ancient Leadwood trees are found in the lounge and the dining room as part of the structures. A perfect spot to enjoy a refreshing thirst-quencher while watching game come to drink. Motswiri offers traditional and creative cuisine as well as outstanding personal service. 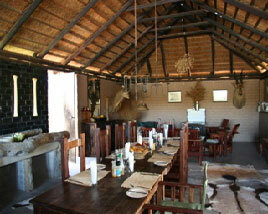 We have the dinning room and, close to Motswiri's main lodge, there is the boma (grass hut), an open air dining area. On cool nights listen to the sounds of the African bush while enjoying a sumptuous dinner next to a blazing fire and under a blanket of the stars. We offer delicious game dishes and our chef is happy to cater for your dietary/special requirements. Please inform us of these prior to your arrival. The main lodge offers a library area with a number of informative books and magazines on the area and the wildlife. These are available to you for the duration of your stay. Visit Motswiri Lodge to experience the mystery of the Kalahari's immense natural history, exhilarating wildlife, ancient legends and rich cultural history and to relax and revitalise body and mind. If you choose to soak up the African sun there is the opportunity to swim at Serebe, the oldest reservoir within the reserve. Our attentive staff are happy to organise refreshments to take with you to our deck and swimming facilities. Not far from Motswiri lodge, is an isolated bird hide, which is located at the edge of a water hole, where a multitude of birdlife comes to drink and chatter the day away. The water hole is tree shaded and is a serene hideaway where you can enjoy a quiet sundowner, while watching the local bird life, perhaps a Giraffe, Kudu or Gemsbok will join you for a drink. Horse Riding: Guided horse rides throughout the reserve. We have introduced Boereperds to Kanana as they are relaxed and of sturdy nature. They have been bred to exist in the arid conditions of rural Southern African and are very accustomed to walking through the bush. The Boereperd by its very nature are placid and easy to handle, which means any standard of rider can explore the reserve without fear. We have two options: An outride. Where you can decide how long and how far you would like to ride. An over night bush experience. You will start out early in the day and meander through the reserve, stopping for a picnic lunch and overnighting at a fly camp. In the morning after a hearty breakfast you will head back to the lodge. The San / Bushman have been resident in the Ghanzi District from time immemorial; their lives are intertwined with the workings of farms throughout the region. Kanana Wilderness supports their intention to maintain some of their age-old traditions, by creating an opportunity for them within our approach to tourism. Cultural bushman evening. Spend the evening with the bushman around the camp fire as they illustrate their traditional dancing. Ada, who herself is a descendent from the bushmen, will translate and give you an extraordinary incite to the meaning of their trancelike dancing. Spend a few hours walking through the bush, with a bushman as your guide. As you explore he will explain the various edible plants and demonstrate a completely different perspective of the language of the bush. The arid areas of Africa continue to surprise those whose interest is bird life. The Kanana pan system attracts thousands of sand grouse together with flocks of guinea fowl and doves which in turn sustain the raptors - Bateleur, Marshal and other eagles, with Vultures, Goshawks and Kestrels in close attendance. Throw in the variety of Rollers, Shrikes, Starlings and hundreds more; and you can see why Kanana Wilderness is considered by many to be a veritable birdwatchers paradise. Hosts are pleased that they have been able to organise authentic bushman cultural experiences at Kanana Wilderness for the 2007 season. These are not commercial demonstrations performed by rote but will be carried out by some of the few bushmen still living their traditional lifestyle deep in the Kalahari close to Kanana. This means that we need prior notice so that we can organise to have the bushmen in attendance particularly for the Trans dance which requires the services of a "doctor". The Trans dance cannot be guaranteed as it is something special and not done to order it requires the right circumstances and conditions. We have organised these activities with Ada Hardbattle - a Ghanzi lady who is the product of a 1940's marriage between a London policeman and a bushman lady. Incidentally Ada still lives with her mother who is now over 80 years old. Ada is an enigma and a living part of this fast vanishing culture - with one foot firmly in modern day Botswana the other in a culture transcending the millennia. Ada speaks the bushman language fluently, as you would expect given that it�s her mother tongue � and will accompany visitors and share her heritage with them. We, at Kanana, although we live amongst the bushman people rarely experience more than a fleeting glimpse of this culture, for us to have this opportunity to see and experience it is a rare privilege appreciated even by ourselves who are so close yet so far. Ada has offered to organise the following - should people have a particular preference such as stalking game or say participating in the creation of a traditional meal using natural bush products found on the walk, we can try and organise this. Kanana Wilderness�s ten white rhino roam wild and free. With the expert guidance of one of our bushman trackers, it is possible to approach these pre-historic mammals on foot and view them safely. Prior to setting off your guide will explain the safety requirements of walking in the bush. He will explain how you will approach the rhino and what you should do if the rhino become aware of your presence. Walking with the rhino should be safe as long as you listen to your guide and behave as he instructs. Enjoy a morning walking in the bush guided by a bushman who has been walking in this environment all his life. As you move as silently as possible through the veldt he will point out indicators which communicate to him when and what the Rhino�s were doing during their daily meanderings. As you get closer to the rhino that you have been tracking, you will notice your guide�s demeanour changes and how he silently implores you to mimic his movements and reduce your noise level so as not to surprise your unsuspecting target. As with everything in the bush, nothing is guaranteed, but most walks culminate with a heart stopping, adrenalin-pumping moment as you get your first �on foot� sighting of one or more of these great beasts. Stand still and absorb the moment as you observe the great white rhino in its natural habitat. If you make your approach correctly there is a chance that your arrival and departure will go unnoticed and the rhino�s daily routine will continue undisturbed.